OAE or otoacoustic emission testing (see here for introductory material) is the recording of sounds that the ear produces itself. Otoacoustic emissions were first reported by Kemp in 1978. They appear to be generated by motile elements in the cochlear outer hair cells (see image above). The OAE devices used in most clinics are "screeners". The typically check 5-10 frequencies and report whether the signal/noise ratio exceeds a preset limit, in which it indicates that the ear is a "pass", or if not, a "refer". This "go/no-go" type of output is often helpful in deciding whether there is any hearing problem -- people who "pass" at all frequencies are unlikely to have anything seriously wrong with their inner ear. OAE's are quick and not bothersome to patients. Sweep OAE -- This device, used in our clinic in Chicago, plots the difference between the noise floor and DPOAE response continously, between 750 and 16000 Hz. 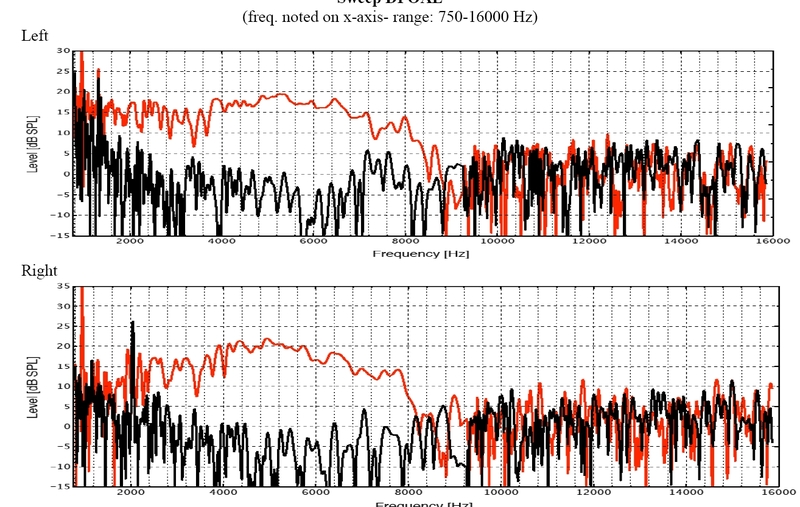 This normal person had good OAE's at all frequences up to roughly 8000 Hz. More detailed output can be obtained from sweep OAE devices. This may have some special utility in Tinnitus. A comparison between the two techniques (screening vs continuous) is discussed in this poster. Dhar, S. and C. Abdala (2007). "A comparative study of distortion-product-otoacoustic-emission fine structure in human newborns and adults with normal hearing." J Acoust Soc Am 122(4): 2191-202. Dhar, S., R. Abel, et al. (2009). "Exploring the relationship between physiological measures of cochlear and brainstem function." Clin Neurophysiol 120(5): 959-66. Shaffer, L. A., R. H. Withnell, et al. (2003). "Sources and mechanisms of DPOAE generation: implications for the prediction of auditory sensitivity." Ear Hear 24(5): 367-79.